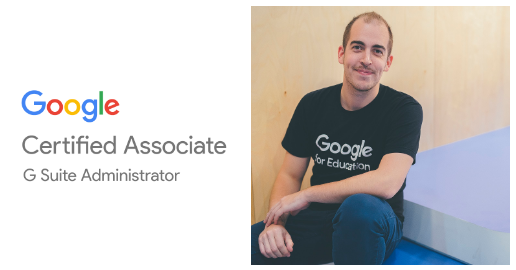 We focus a lot at AppsEvents on helping people become ‘Google Certified Educators’ but there is another important Google Certification that we are getting more involved with in 2017… the ‘Google Certified Administrator’. So what is this certification and why should you look at getting it? The exam itself is a three hour practical test on a live G suite system where you actually perform live admin tasks and are monitored via webcam during the exam. Google recommends up to 6 months experience as an admin to pass the exam but we have had many people take our two day admin bootcamp (info below) with no experience and passed the exam first time, so it’s nothing to be feared. So who should take this? Well firstly it’s important to say this exam is the same for both Business and Education users and is not specifically Educator focused. Of course it’s suitable for any tech staff, but also increasing numbers of teachers and other staff are taking the certification. We talked about this in a blog post on the ‘democratization of IT’ two years ago and the trend we spotted has only continued. The great thing about G Suite admin is its granularity, so you can give staff access as an admin for certain groups and certain tasks, so it’s easy to involve more people to help the system run more smoothly. Especially in small companies and schools it’s often important to get as many staff as possible helping with admin. All the info you need can be found at this link http://certification.googleapps.com/admin and if you would like to join a two day bootcamp to take you through the material we’d love you to join us at an AppsEvents Admin bootcamp. We have dates across Europe, Asia and the US and more info you can find at appsevents.com. Don’t see a date you like? Fill in the form on the site and we can potentially host one with you.